With austerity continuing to bite, and the debate over cuts in funding to vital services such as flood defences at fever pitch, Britain’s humongously expensive Trident replacement program has rarely looked like more of an anachronism. With an expected lifetime cost of at least £100bn, the proposed modernisation of our nuclear deterrent is, by some margin, the biggest British investment project on the table. But though the project is far from uncontroversial, its probably fair to say that it has paled alongside the considerably cheaper HS2 in the public debate stakes. It’s a curious thing. On the one hand, we have a new rail network designed in response to an identified need for extra capacity. On the other, a relic of the Cold War designed for a threat that many agree no longer exists. Yet, for now, the rail network provokes more ire. According to a report out this week from the Nuclear Education Trust, this needs to change. With the government’s final decision on Trident due in 2016, the independent report calls for an intelligent nuanced public and political debate on the Trident replacement programme before we commit to spending money that could be invested in other areas of the economy. It’s an interestingly balanced piece of work drawing on contributions from, amongst others, General Sir Mike Jackson, former defence secretary Malcolm Rifkind, and a host of academics and defence industry insiders. Some contributors back a Trident replacement programme, others question the legality of the move in the light Britain’s nuclear non-proliferation treaty obligations. But despite this there are some interesting areas of consensus, not least that a decision to replace Trident should be based on evidence, and a clear understanding that it represents the only solution to a credible threat. There’s also a growing feeling that investing around £100bn in addressing a threat that may or may not exist at some point in the future is a rather inconsistent way of going about things. Yes, this debate is long overdue. I definitely think Trident’s replacement should be cut from the government’s budget as soon as possible. Whether you think we need an independent nuclear deterrent or whether you don’t is an academic argument in my opinion. The fact of the matter is we haven’t got the money to pay for it. I would venture to state that the reason very few people keep complaining about Trident is indeed the fact is has been going on for so long. I suspect many people (myself included) assumed that, whatever decisions were required had been taken, whichever way it went, and that it was a fait accompli. And that the next time we would hear about it would be when the Tridents were decommissioned and the replacements rolled out. How much of the expense is the incredibly long drawn-out decision making process? I thought the idea behind deterrents like Trident was that they are highly secret, in that case we should say nothing about them no discussions, nothing just let a few of the Subs run round doing exercises and popping up now and again and in theory no one will know whether they are armed or not effective or just a shell? Unfortunately it appears that the Royal Navy wants to keep its hands on such a prestigious – if not anachronistic – weapon and delivery system. We already have the alternative with the cruise missile weapons carried by existing submarines, that could be relatively cheaply and quickly expanded. Our land forces have also had to change to meet new requirements – even the Challengers seem out of place now. Time to move on. Because there are already hospitals that can deal with a pandemic, albeit with a lot of overcrowding. The decision over Trident is whether to have nuclear weapons, it is not about additional capacity. A well balanced military force needs to be prepared for any eventuality, not just those that are predicted at the moment. The question then becomes whether we are willing to take the risk of foregoing such flexibility in order to save money. Personally I would rank the importance of HS2 over Trident but there is a big difference in funding: I believe HS2 is a national investment that will more than pay for itself whereas Trident is an insurance policy that hopefully will never pay out. The two decisions are mutually exclusive. Today and now; we need to re-appraise both our priorities and value judgements. John, the answer to your last question is so simple. The conflict groups -who run’ the Establishment [those who go to work in fancy dress, have elaborate initiation techniques before you can be one and hide behind the Royals-QC-lawyers, Queen’s Commission-military, Queen, head of Church of England et al] have never given the slightest attention to the needs (such as preparing for a pandemic or for that matter for inundation with the wet stuff!) of the ordinary population as they are unlikely to be personally involved. Likewise as they are no part of either democracy or capitalism (having cleverly insulated themselves and their living expenses from both- yet relying on those of us who actually create wealth… they care not a jot for any activity which might enhance that either. Of course, as long as our society was comprised of a thin crust (or should that be cream or scum) of aristocrats and a vast number of primarily agricultural ‘proles’ (or plebs if you prefer) they could get away with it. Particularly as they controlled both access to and the results of any challenge in the Courts. I really believe that we are reaching a crunch point in our society. We have at present more persons -technically educated and active- than throughout history -able to provide rational thought and analysis based on scientific principles of evidence, rigour etc: and we STILL have to put up with the antics -political and managerial- of persons, supposedly our betters, who would be laughed out of a GCSE level technology exam/test/experiment if they offered the same type of ‘evidence’ as they use to convince that jury of purchased persuasion (created by the once every 5 years or so trick played on the population called an election…) called Parliament! On the question of Trident just look at the history of the previous century, we nearly lost WWII due to lack of weaponry. The question that should be asked is about the cost of Trident and how the MOD control that and who keep BAE under control, profit is essential in any business but excessive profit through poor project control well that is another question. Do we need HS2, no but what we need to do is to invest in the railways so people can travel in improved conditions and get more freight on the railways. We live in a difficult age, if terrorists use a dirty bomb in London, who are you going to retaliate against, especially if they are home grown terrorists. Nuclear weapons were a deterrent in the past against war between Russia and the West. but the war is over and common sense is beginning to take over. Pretty soon everyone will have nuclear weapons, particularly the Middle East and the whole circus of deterrent will come around again. The big question is, “How do you deter someone who cares nothing for humanity or this life and is only interested in martyrdom and the next life” Trident, or its updated system may be less than useless against such an enemy. There has to be something else other than the big bang theory, put the money to science and research and perhaps fusion after all most of the conflicts will be about energy in the future and let’s face it, that’s what most of them seem to be linked to now. My view about the Trident replacement is quite simple, stop talking and just get on with it. It is not a question that needs any further discussion. HS2 and other demands upon the Exchequer must take their course in turn. Well perspective is everything…The program is hardly a relic of the cold war as displayed in the article. 1 Nuke is what it would take to level your rail system, eradicate life on your island. This submarine while expensive is what keeps your enemies at bay, knowing that if they decide to do so there is a response that they too will not survive. While it is not a pleasant thought, take a visit to Nagasaki or Hiroshima, and consider riding the train away from such a blast with no way of preventing it in the future… Just a thought. What is the sacrifice worth for such security, 3 pints per year each for a decade? Sign me up. The most likely reason why there has been much less public debate over Trident than HS2 is down to how these projects affect the community. The building of a few submarines will have little impact on the house prices and noise levels of those living nearby. Unless used to their full potential there will also be limited environmental impact from the submarines. The majority of those who are anti-HS2 are people who live along the proposed route whose houses will lose value, (in some cases will become unsellable), will be significantly affected by construction, have increased local noise levels, and who care about their local environment, all without seeing any benefit. £100bn over 30 years is more like a 1% rise in the basic rate of income tax – so much closer to 3 pints a week than the 3 pints a year you claim (unless you drink really expensive beer that is). Having read all the comments so far, but not the whole report/debate, I would like to add my two-pennorth. I would suggest that a cheaper, tactical nuclear deterrent, delivered by cruise missile was adopted. This could be delivered by all services – land, sea and air using ‘standard’ units thus giving economies of scale regarding costs. Certainly, given the dire straits we appear to be in financially, as a Country, how can we afford this outlay ? Is it just to keep up with the Jones’s(USA) ? 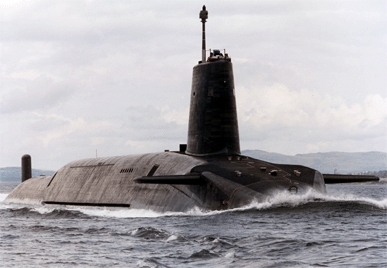 I would also like to ask a (maybe stupid) question: Exactly why do we need to upgrade Trident ? I mean, do these missiles ‘go bad’, or faulty, over time ? Keep Trident. Pay for it by delaying the programme slightly; delaying or cancelling HS2 and leaving the EU. Come to think of it, leaving the EU would pay for HS2 anyway and allow more money for flood defences. Please make very clear the difference in cost/timescale/requirements for developing a new fleet of submarines, and/or the replacement of the nuclear warheads/missiles. The two get spoken of in the same breath. In the week when we finally wake up to to the fact that we are going to have to spend a vast amount on climate adaptation measures – it would be helpful to know just what the nuclear deterrent shopping list contains. The point raised by Mr Phebey has merit and we do not know what lays just around the corner – who says it must be a small terrorist group we must deal with. Also the Trident program keeps may people in work across the country. It also keeps a scientific community up to date in a field that has many spin-offs as opposed to our aircraft industry that was allowed to fall by the wayside. I believe that Trident is a necessary contingency for our future. Once we stop making nuclear weapons and close AWE down we will never be able to make them again. The capability will be lost forever regardless of whatever threats emerge in the future. That’s quite a big gamble. Besides having the capability is about more than the weapon, I believe it is about our current seat at the top table. The problem is on maintanence of these submarines that the UK are not informed about. One of the old type broke down in the Falklands and was towed to Gibralter to be fixed. They had to upgrade the yard to get the authority to have it fixed. It took a year for it to be fixed. I am sure if it was done in any main port of the UK everybody would have heard about it and complained. It seems people are ignorent about the problems these type of vessels have unless it happens in their back garden. the object of a deterrent is to deter, if we haven’t got a deterrent we cannot deter someone with a nuclear weapon from threatening us, North Korea springs to mind but there other countries developing their nuclear weapons and they may not always be friendly. you cannot build a Trident Sub overnight ! If you oppose this, ask your MP to speak out against it. Any investment needs a return. Trident gives no return. With £100bn on tidal turbines, energy storage and reliable renewables, we could be making a return on investment before the Trident was due to be commissioned. I love expensive beer…:O): Todays news: TEHRAN, Iran – Iran has successfully test-fired two missiles, including a long-range ballistic weapon, the official IRNA news agency reported on Monday. The report by IRNA quoted President Hassan Rouhani as congratulating the military. My point is that the adversaries of state security are not going away, if anything they are growing, Pakistan? Statements to the public like there is no longer a need are irresponsible and not founded in open source facts (if willing to look for them). Although talk of there is other methods that someone may threaten or attack are true, they do not usurp the need for self-defense for this particular threat. Using the logic of USSR/China no longer being an issue, but forgetting the rest of the globe is just irresponsible and may be potentially catastrophic to the society’s very existence in the future. You are effectively stating that you can project the political climate in every country on the globe for the next 2 decades. Can you pick my lottery numbers this week as well? Facts are that Country’s change political positions over time Germany/Japan/Korea… Even during the golden era of wood ships and cannons the Kings & Queens of the time did not remove their standing army or eradicate their defenses, because they rightly understood that the very existence of society might depend on them in the future. The present is no different for the educated, just the methods and tools needed for defense. There can surely be little doubt that we need to replace Trident. Within NATO and as a robust and worthwhile EU partner state we need to bear our share of responsibility for security at the highest level. Agreed, eye-warteringly expensive, but there IS decent evidence of continued investment in top drawer defence equipment elsewhere, notice the aircraft carrier programme in China? or the shipbuilding in Russia? We need Trident and fortunately (still) have the engineering skills to design and build it; Push on! I will ignore Mike b’s diatribe, akin to an extreme communist view I haven’t encountered in many a year and concentrate on Trident replacement. If it is needed or not? If you agree with the naive assertion of ‘ Peace in Our Time’ from Neville Chamberlain and convince yourself there is no threat to our cosy and peaceful way of life then yeh! you are right we don’t need it. If however you are realistic enough to know how stupid that would be. That a change of regime in any of the supper powers – China – Russia – N.Korea or others that will emerge in the future, and I have not even mentioned the international terrorism hot potatoes that may be fed by the other “stable” Middle Eastern wana bee’s the likes of Iran. Then it is clear there ARE threats that we need to deter – Trident and its stealth capabilities have successfully helped keep the peace for my life time and I would like a replacement to do the same for my grandchildren in the years to come. So the question is do you want to spend the money which will also help scientific research and development or do you just want to fly blind into the mountain and lose everything as Chamberlain almost did all those years ago? The material below written before I read Nigel’s views. He might enjoy this. I am of a generation who like Voltaire, “did not particularly care for what another said, but would be prepared to give his life to ensure he had the opportunity to say it” As my own father did in 1942. Our Editor is aware (from non-public exchanges) of other aspects of my career have may have assisted that view. That last time I looked, I did NOT see a fleet of nuclear powered submarines or aircraft carriers under the ‘flag’ of nations (notionally not the winners in either of the last two major world wars) slowly patrolling the shore-lines and sea-lanes of our island. I do see machine tools, measuring equipment, data recording/processing, (sound and visual), vehicles of all types, indeed the entire panoply of manufactured goods ‘marked/marqued?’ with their -losing? name-plates/flags/trade names everywhere within our island: and all over the world where influence and consequent economic power are required. Is there a suggestion that these two nations do not have a seat at the top international political/economic tables because they are not as blessed as we appear to believe we are? with the capacity to make and deploy these terrible weapons some seek to retain? Weapons which would create an after-life wherein those who were unfortunate enough to have such would wish to be amongst and envy those who did not. Oppenheimer (like Nobel before him) sought to ensure that future post-nuclear warfare would include everyone, even those doing the sending-off! The terrorist nations we seek to contain have surely simply followed his lead. second, to offer scholarships and education in ‘our’ ways. [decency and decorum, intellectual honesty and academic rigour, fair-play? Are there more] which would show those so marginalized that presently they are sufficiently misguided as to wish us ill: whatever the consequences, that there is a better way. That of peace. Saying the £40bn HS2 build-cost is cheaper than the £100bn through-life costs of Trident shows a lack of understanding. You are comparing two completely different figures. That aside; if you wish to have a nuclear deterrent, which does not heighten tensions in a crisis. ..then the Trident system with enough boats to maintain 365 day cover is the most cost effective way of delivering that deterrent. Contrasting Trident and HS2 is creating a deliberately misleading debate. Plus, I doubt that John Excell has sufficient experience of the Defence Industry and knowledge of Warfare, likewise the Rail Industry, and all the other Big Spenders. For example – Total Life Cycle Cost (Trident) cannot be compared with Start-Up Costs (HS2) … at the more likely Start-Up Cost of £60Bn (HS2) and a Total Life Cycle Cost (although such is meaningless, but assume HS2 is to last 30 years) of £200Bn for HS2 – someone needs an Education in Costing ! Also, people develop short memories in Peace Time. Hence the greatly reduced Capability of the Defence of the Realm. It is Fair to discuss all Public Matters of Expense (in the appropriate circles, which this is not – it’s merely a ‘steam-blowing exercise’ for the Grandisement of “The Engineer” – and yes, I am now a Consulting Science & Technology Defence Engineer). But please – compare like for like. The Travel Infrastructure and the Environment Infrastructure (including Services) are ALL Big Spenders. – The longer the debate, the higher the Cost. That has been proven over a century of Engineering, around the world. Let the REAL Experts set out the Conditions, and let the REAL Decision Makers get on with their Jobs. You always have the Ballot Box, and 2015 is not that far away. Yes, but with a new Trident we can be the most heavily armed bankrupt country in the world. Another first for Britain! Yes we need to talk about Trident replacement. We need to ask why annual waste in the NHS exceeeds the total cost of replacing Trident. We are a first world country or we are the third world country Labour will make us. The first world country has Nuclear capability. Which of to potential enemies that we were once facing has given up their nuclear capability or shows any sign of doing so? It is interesting that HS2 and the Trident replacement are getting linked in this debate. Both are prestigious projects which mean jobs for companies involved in the construction. Both are largely about being part of an elite club of nations so we can strut about and be “part of the club”. The real question for both projects is whether there is a real need rather than a desire to have. I’m not anti nuclear weapons per se but I’m not really convinced by the deterrence argument either. Did the presence of nuclear missile submarines deter Argentina from invading the Falklands? Did owning nuclear arms help in the Gulf? or Afghanistan? or any of the other many conflicts since the end of WW2? Warfare is a really strange game in which you are not permitted to use your best weapons because that wouldn’t be fair. Weapons are a bit like tools, I think. You don’t fix a watch with a sledgehammer or pick your teeth with a pry bar do you? How efficient is a tool that works for you all day and night even when you don’t use it: something that takes certain outcomes off the table, completely out of consideration? There are at least 8 ‘Nuclear’, countries in the world…I don’t want the UK to be the first to start to unilaterally disarm. We are not living in a perfect world and must ‘hope for the best whilst preparing for the worst’. I don’t know who said that first but it seems a good mantra to repeat and follow for the foreseeable future. 1. The UK needs to be able to deter WMD threats – including those presently unknown – for the foreseeable future. 3. Ballistic missile subs have fulfilled criteria (1) and (2) in the past. 4. My question is whether the same will be true in future: For example, what happens when an enemy can fill the sea with thousands of smart drones? Will our subs still be able to hide or will they become expensive white elephants? This is the kind of conversation that our politicians, military and defence companies need to be having. Having read all the mostly pertinent points by contributors, I can’t help thinking, to quote, “Speak softly and carry a big Stick” it’s the only thing some tin pot, dictatorship governments understand. If Syria had nuclear capability where would be now? I don’t believe an eye for an eye is an appropriate answer where nuclear weapons are concerned. Maybe I’m a young naive idealist but if we ever were attacked, nuclear retaliation, itself massacring thousands more innocent people, isn’t the way I’d want to go. Other top tier nations – Germany, Canada, Japan etc have no nuclear deterent. We need modern conventional armed forces fully funded and capable that meet the threats of the future. Any nuclear war would see us obliterated anyway. We should stop getting involved in other peoples problems and sort out our own. We could do a lot better for our nation with £100BN than use it on more nuclear weapons. The point about this submarine based technology is that there is almost no chance of wiping it out in a pre-emptive strike. With proliferation more likely than not in the next 20 years surely we need to maintain a credible nuclear threat. Editor, Just noting your comment to Anonymous above “….The total annual NHS budget at around £100bn is actually about the same as the current estimated cost of the Trident replacement programme…..” And this has and will rise every year throughout the life of Trident and its replacement’s development and life. So effectively although the corespondant did overstate the case slightly, government funding is (quite rightly) hugely skewed away from defence research and towards public health. In reality the cost of developing The Trident replacement will ultimately represent a fraction of a percent of the money that will be spent on the NHS over the period of the next 40 years, even if the numbers do not change at all it will still only be about 2.5%, probably less than the successive decorating budgets for the NHS over the same period. Trident’s successor (and its own future replacement) costing 2.5 billion a year pumps a huge amount of money into British R&D and maintains a skills and knowledge base that without it would simply not exist. I have personal experience of this. If we were not working on deterence, the money would not be reallocated to support R&D or manufacturing infrastructure at all, it would be either not collected by the Tories in the form of tax cuts or spent on other Public funding by Labour, either way not building nuclear missiles will result in a net loss of science and engineering funding to UK scientists businesses and engineers. If the government were to propose spending the £2.5B a year on space exploration and that value in GDP was written into law to be spent for all time on Space exploration then that money would still not be as safe as it is with a specific defence related purpose. We are bound by Treaty with the USA to keep a system like Trident. If a deterrent works, it is always difficult to quantify the benefits. I believe that Trident should be replaced but there must be scope for a reduction in size and hence cost. Each submarine carries 16 missiles. Each missile can carry 12 warheads. The 1998 defence review limited the warheads to 3 per missile, a total of 48. This being the case, why are we not designing smaller, cheaper submarines that carry 4 missiles with 12 warheads? Since there will never be any major wars, nuclear deterrent or any other major weaponry is a waste of money, right? There was a distinguished British committee, whose name I do not recall, which in late 1920s voted overwhelmingly that there is no danger of war for at least 10 years. This led to unilateral disarmament. The sole dissent was from Balfour. He said it is impossible to say what will happen in such time frame. All I can say is Yep. When North Korea or any other rogue state develops nuclear missiles that can reach UK we’ll be more than glad of the next generation Trident. Imagine if Hitler had had nuclear V2s and we didn’t. I think the 100bn could be far better spent elsewhere in the overall UK budget at the present time. IF we have got that kind of money to spend, lets look at helping out all the poor souls who have had their homes and lives ruined by huge amounts of water first ? I thought we were broke, and yet it seems that the government can find money for things that we probably do not need – Trident, new aircraft carriers, what is it half a dozen new fighter aircraft that can’t yet fly and will be too expensive to put in harms way. Lets spend the money on simple projects such as bringing our roads back from third world status – you know things that will benefit the most people: transport, housing, health & power, not bailing out bankers or debating Scottish independence or thinking that we are important enough to be a world power. But it won’t happen will it? as long as current candidates are in power. That £100bn would go a long way towards developing one or more of the 4th generation nuclear energy technologies. This would address the need for a reliable, sustainable and environmentally benign energy source and develop exportable UK industrial capability. The benefits are tangible and obvious. Can we honestly say a Trident replacement would make a bigger contribution to national security? Remember the cause of the American war of independence where the south sought its own sovereignty. If UK tries to exit EU might the same kind of war be ignited. It might not come to that, but it is not better to be sure. why shoud any small, non-strategic country with an excessively overbearing sense of its place in Wolrd affairs want to spend huge amounts of taxpayers’ money on a weapons system that will not protect US [pun intended] against the real threats of the next four decades? the recent weather reminds us all that infrastructure and economically vital education standards will be essential areas for capital investments. all we need to do is convince the decision makers where the real priorities lay. With alternatives at hand I would presume the replacement of Tridents could be mothballed. However seen in the light of the present geopolitics it might be an alternative to develop the Tridents successor in a more versatile contraption e.g. the ability to do more than just simple nuclear deterrent. We’ve got Trident and it presumably works, why does it need updating? I’m strongly against this money being spent – I’m all for defence spending, I think we should be spending heavily on state of the art aircraft and navy vessels with defence and launch capacity to INTERCEPT any nuclear attack from another power or strike and obliterate their nuclear facilities. Personally I think that having a full blown nuclear weapon is non-sensical. We will never use it, ever. Saying it is a deterrent against tin pot dictators is nonsense, they know as soon as they launched a nuke the world would descend on them and take them out – a nuke in retaliation still wouldnt be used. Anybody launching a nuke knows that it is suicide – if they are detached enough to fire anyway then us having a nuke too isnt going to stop them. My personal view is keep this money in defence spending (so that you still get the engineering benefit) but focus it on state of the art bombers/naval capacity etc etc so that if a threat does start emerging we have the capability to strike and take it out before nukes start getting fired back and forth. Not my field but thats my thoughts. I’d rather see this money getting spent on a European defence shield, research into state of the art nuclear/chemical weapon detection technologies etc than a sub that is going to cruise around never being used. Hell I wouldnt even mind the money going to start of the art subs that can strike at the enemies facilities with cruise missiles etc but not necessarily with the nuclear capability. Is that part of the debate I’m maybe missing? Can these subs sit offshore North Korea say and shoot down a nuke that might be fired? Or destroy the launch facility. That would be a more logical spend so far as I’m concerned and it still seems that would be better done with ‘interceptors’ based in the UK. Prof Michael Clarke should come up with more sensible analogies. Funding 20 hospitals will not serve as a deterrent to any pandemic developing. The subs serve as a vital deterrent to help prevent the unthinkable. How do you value that?